The BIG BUILD is all about continuing to ensure that Peterborough City Rowing Club provides its members and visitors with the best possible facilities for the sport. 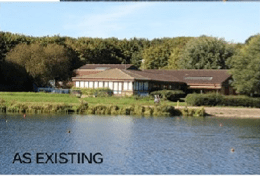 The present clubhouse was built in 1983 and although it has been extended in the past the time has come to extend and improve it further to cope with the expanding membership and hugely successful regattas. Planning permission has been obtained and now we are working on a fundraising appeal to raise £1 million. A fundraising committee has been formed and consists of Caroline Graham, Pete Forrest, Steve Brown, Damen Sanderson, Hugo Spiegl, Gee Rossouw, David Gray and John Canton. The estimated cost of £1 million sounds daunting but our Treasurer, Hugo Spiegl, has been careful with our resources in recent years and we have some funds in hand. In addition Rolls Pollard, who was Chairman of the club for 37 years and a lifelong supporter, made a bequest in his will and this has given the club a sum of nearly £100,000 towards this project. In total the club already has some £200,000+ towards the £1 million needed. We will be making funding applications to trusts and foundations, Sport England and making approaches to local companies. Other fundraising activity includes the “buy-a-brick” campaign, potential regatta sponsorship and the “round-the-world” challenge. More ideas will be welcome and if you have any suggestions please talk to any one of the committee members. Redesign of the grounds around the club to accommodate the new extensions. 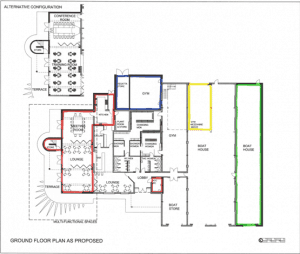 The club has an architect and specialist advisers working on detailed specifications and obtaining building tenders. The aim of the committee is that builders should be on site to construct at least part of the building improvements in September 2019.